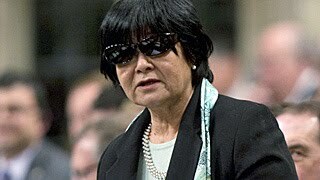 Now if she ain't guilty why does she look guilty, wearing her sunglasses during question period...what was that about lying eyes....Meanwhile yesterday Rona Ambrose played blocker during question period, hiding Oda from the cameras.....Guess because Rona is Minister of Women.....a position Oda once held, when a hatchet-woman was needed to cut funds to women's groups that were deemed too liberal by the Harpocrites and as ordered by the PMO. With her new position as Minister of CIDA the PMO decided that the church funded Kairos was too liberal and too activist, so once again their hatchet-woman did the deed and cut Kairos funding...only she could not justify the cuts...so she lied to Parliament about it. Some speculate Mr. Harper’s protection of Ms. Oda, however characteristic of his government, may be compounded by another factor: The opposition alleges the decision to modify the memo originated in the Prime Minister’s Office.